If you own a domain, this guide will show you how you can easily connect your domain to your Leadpages account and publish to that domain (i.e. https://yourwebsite.com/your-page-name) instead of your Leadpages domain. If you have hosting at a domain you own, simply follow the CNAME instructions below, but perform them at your hosting service's cPanel, rather than domain provider. Already have a site published at your domain? No problem! You can still connect your domain to Leadpages, you'll just want to use a subdomain other than www using the same steps below. 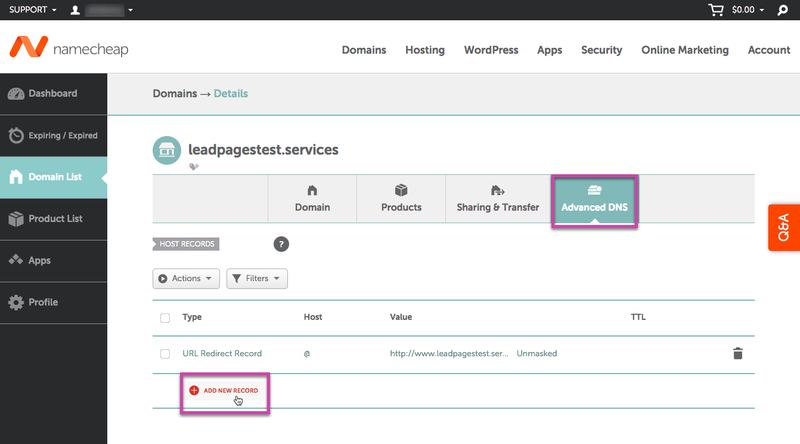 Without a subdomain, connecting your domain to Leadpages with an existing site built there will result in that site being overridden by Leadpages. Your site would not be deleted, but essentially hidden and inaccessible behind your Leadpages content. Learn more about subdomains below. There are a couple things you should know before connecting your domain. Pages are still hosted on our servers—we do not publish pages to your server directly. 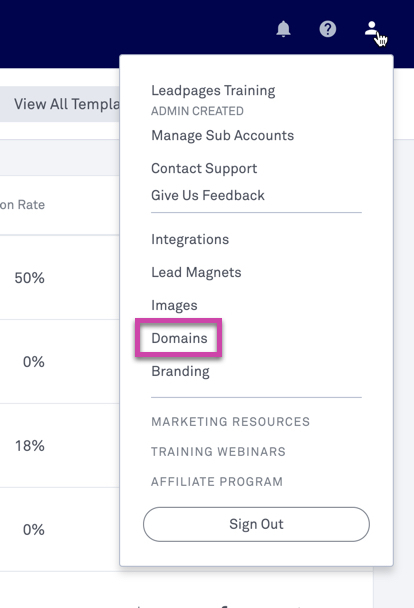 A Pro or Advanced subscription is required to connect multiple domains to your Leadpages account. Learn more here. If you'd like to redirect a root domain to a subdomain or vice versa, you'll want to create both a CNAME and A Record in your domain provider settings as indicated below. If you own a domain, you can connect it to Leadpages simply using your root domain or with a subdomain of your choice. A root domain is a domain without a subdomain like www before it. Publishing to a root domain is a great option if you own your domain but do not have a site built at that domain and would like to use it for publishing pages. A subdomain comes before your root domain and allows you to publish content to the same domain while also categorizing or putting your content in a subfolder of sorts. 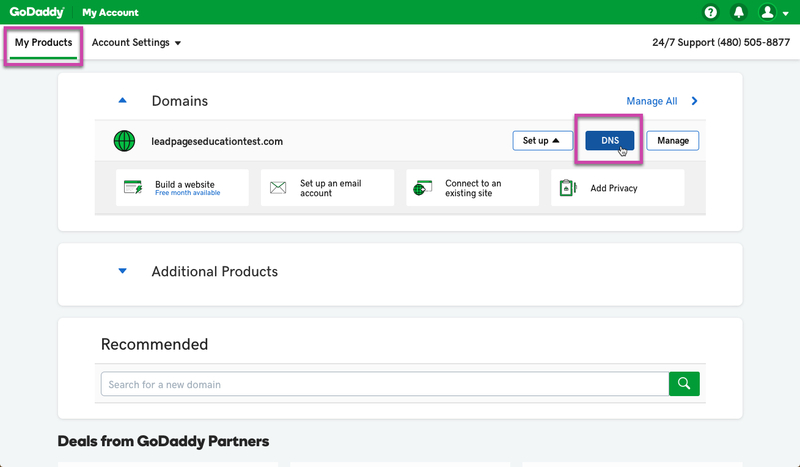 You can purchase a GoDaddy domain and connect it automatically to your Leadpages account by clicking the profile icon at the top-right corner of your dashboard, then Domains and select "Purchase a Domain." Enter the domain URL you'd like to connect to Leadpages and check the box to acknowledge that any information published there will be overridden. Click Next and follow the in-app prompts. NOTE: Follow the steps given in the Leadpages app. You must complete these CNAME and/or A Record steps in your domain provider to make connection. Now, you’ll need to add a CNAME and/or A Record to your domain provider settings. 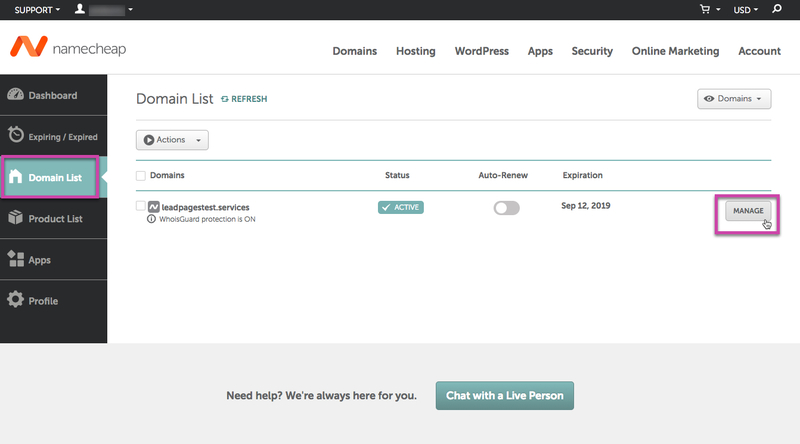 TIP: If your domain and hosting provider is GoDaddy or 1&1 IONOS, you'll have the option to automatically connect your domain, without having to enter your provider's DNS settings. To publish to a root domain (i.e. yourwebsite.com), you'll create an A Record in your domain provider settings. To publish to a subdomain (i.e. www), you'll create a CNAME Record in your domain provider settings. After entering in a root domain or a domain with a subdomain in Step 1, you'll receive step-by-step directions right within Leadpages. Follow the steps to finish your domain connection. 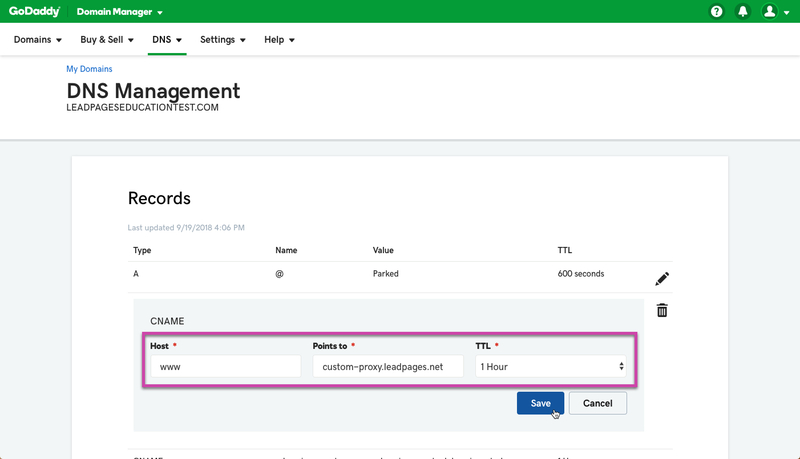 If you'd like to redirect a root domain you've connected in Leadpages to a subdomain or vice versa, you'll want to create both a CNAME and A Record in your domain provider settings. 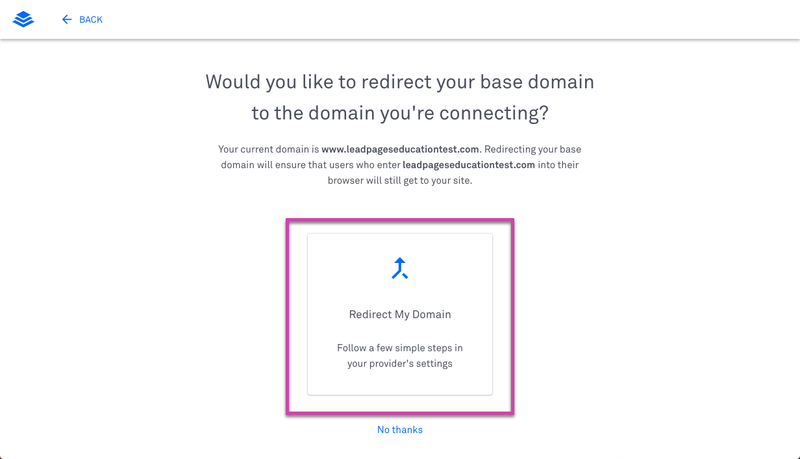 While connecting your domain to Leadpages, step-by-step directions will appear for redirecting. 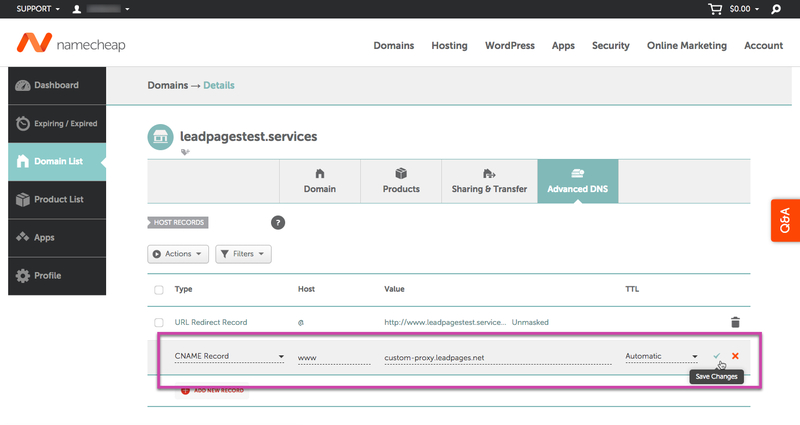 We have step-by-step CNAME & A Record guides below for GoDaddy and Namecheap, similar to the instructions that will appear when connecting your domain in Leadpages. NOTE: It can take anywhere from a few minutes to 24 hours for your domain provider to make the connection with Leadpages and properly map your domain. Automatic redirects are available in Leadpages between a root domain and www subdomain. If you still see a “Pending Connection” message after 24 hours, follow the publishing steps below, which can sometimes resolve the issue. Otherwise, don’t hesitate to contact our amazing support team. 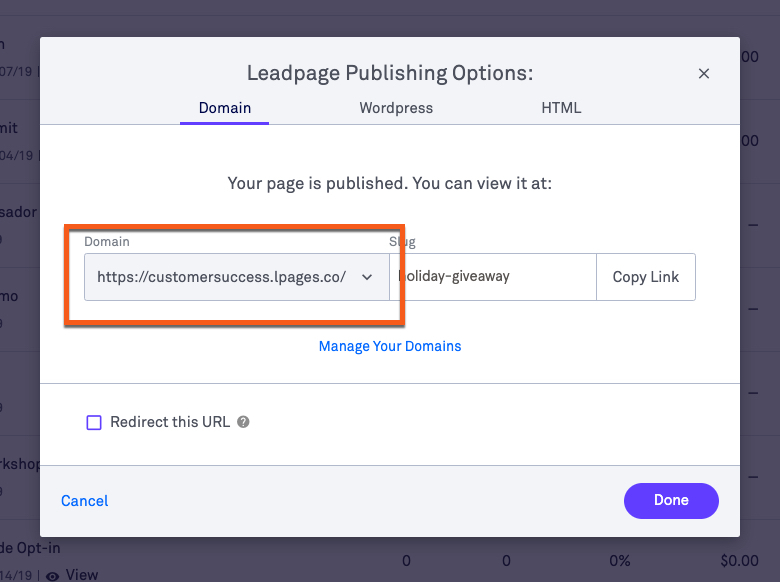 A Pro or Advanced subscription is required to connect multiple domains to your Leadpages account. To connect an additional domain you own, simply start with step 1 above. NOTE: There is a limit of 20 subdomains (CNAMEs) under the same root domain for all Leadpages accounts. Each of these subdomains will count as one connection. If you currently have a Standard subscription and would like to upgrade, learn how here. Once you've got your domain connected to your Leadpages account, follow the steps in this article to publish your site there. 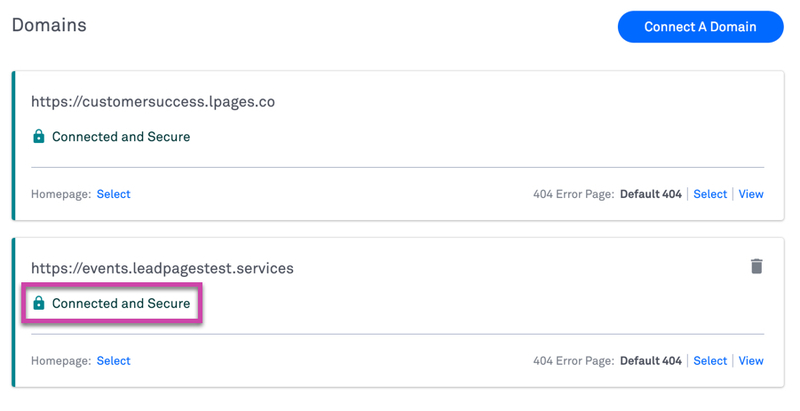 NOTE: If you have a Leadpages Site published to your domain connected to Leadpages, your homepage and 404 error page are set up within the sites builder. Once you've connected your domain in Leadpages, you can select specific Lead Pages you have created as your domain's homepage as well as a 404 error page for when visitors try to access an old page on your site or have mis-typed the page slug. Under Domains in your account settings, click the down_angle button, then Select next to "Homepage" and/or "404 Error Page" to set your Lead Page. Click Lead Pages in your account dashboard, open the actions menu more for your page, then select Publishing Options. Under "Domain," click the drop-down. Select your domain and enter a URL “slug”, which will appear at the end of your URL: www.yourdomain.com/your-awesome-page. After performing Step 1 above, follow these steps inside your GoDaddy account in order to connect your domain. In the example below, our domain is leadpageseducationtest.com. We show both a CNAME for the subdomain www and an A Record for connecting the root domain. Inside GoDaddy, click "My Products," then DNS. 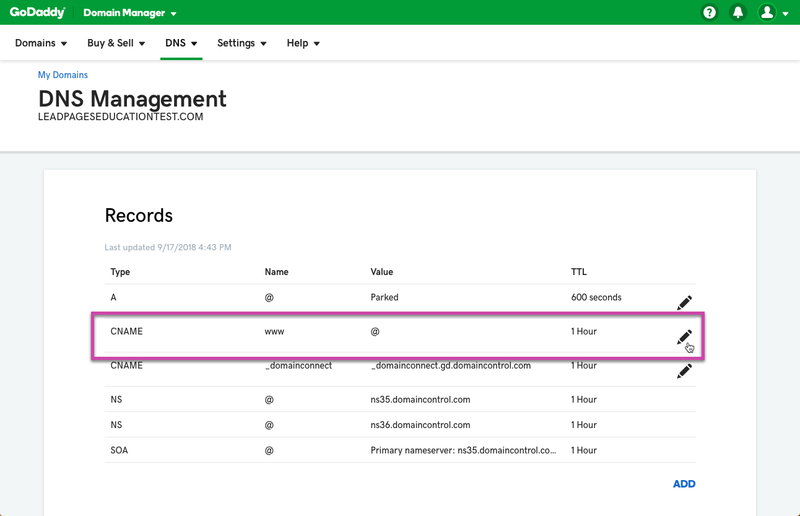 It may take up to 24 hours for the domain to be connected within Leadpages, however, once connected your domain will be listed under Domains in your account settings within Leadpages as Connected and Secure. After performing Step 1 above, follow these steps inside your Namecheap account in order to connect your domain. In the example below, our domain is leadpagestest.services. We show both a CNAME for the subdomain www and an A Record for connecting the root domain. Inside Namecheap, click "Domain List," then Manage. Then click "Advanced DNS" and Add New Record. Click the green checkmark to Save Changes. To get you started, we've linked within Leadpages, as well as below, to some helpful tools from popular domain providers on how to add a CNAME within those services. How is domain security handled? We’re not able to automatically secure pages hosted on your own server (such as through your WordPress site or our HTML download option). My domain is on Cloudflare and when setting up my CNAME, I'm getting an error. Now what? To connect a Cloudflare domain to your Leadpages account, make sure the SSL options on your domain are set to Full SSL or Full SSL (Strict). Here's a resource from Cloudflare on their SSL settings.